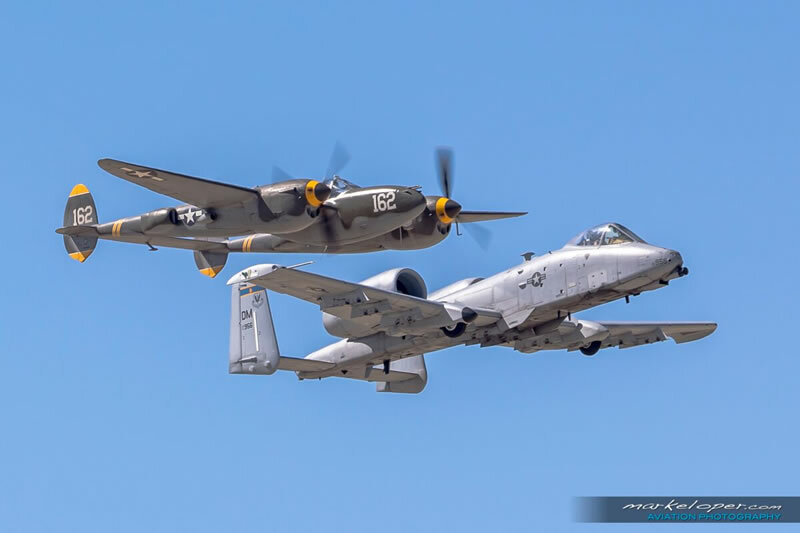 Iconic History On Display … A-10 & P-38 USAF Heritage Flight! 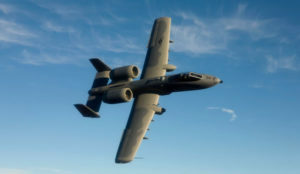 This year’s Air Force Heritage Flight will feature the A-10 Thunderbolt II (a.k.a. “Warthog”) and vintage P-38 Lightning! The Air Force Heritage Flight program (HF), celebrating its 20th anniversary, presents the evolution of air power by bringing together today’s state-of-the-art fighter and vintage fighter aircraft in close formation. The performance dramatically displays USAF air power history and honor the brave men and women who have served or are currently serving. The A-10 Thunderbolt II is just plain cool! So ugly they call it the “Warthog”, a nickname that carries with it a great deal of affection and respect for this plane that isn’t afraid to get too close to the action. The “Warthog’s” large, unswept high-aspect ratio wing and large ailerons give it excellent low-speed, low-altitude maneuverability. In addition, many of the aircraft’s parts are interchangeable left and right, including the engines, main landing gear and vertical stabilizers. Both of these unique attributes make the A-10 easily serviced in remote airfields. This “unbreakable beast” can fly for long periods, has short takeoff and landing capability, and can pick out small ground targets with great precision making it a crucial U.S. Air Force asset. A-10s are simply too effective and too tough to leave out of any battle which is why seeing them at an Airshow is a bit rare! The A-10’s cockpit and portions of its flight control system are protected by 1,200 pounds of titanium aircraft armor, called the “bathtub,” allowing it to withstand direct hits. This protection combined with redundant hydraulic flight systems, and a mechanical system that still works even if hydraulics are lost. This machine gun of an aircraft is a champion of the skies; don’t miss seeing it fly and meeting the crew this September! As a World War II fighter, the Lightning’s legacy is unmatched. 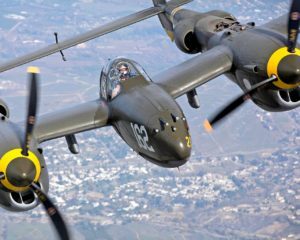 A total of more than 10,000- including 18 distinct models-P-38s were manufactured during the war, flying more than 130,000 missions around the world. The “Lightning” was the first fighter to fly faster than 400 mph, shot down more than aircraft than any other fighter and, as a reconnaissance aircraft, obtained 90 percent of the aerial film captured over Europe. There are only 8 still flying in the world today! This piston-engined fighter aircraft, developed to a United States Army Air Corps requirement, has distinctive twin booms and a central casing containing the cockpit and armament. The P-38 was basically a hand-built airplane and never meant to be mass produced. The P-38 was unusually quiet for a fighter, the exhaust muffled by the turbo-superchargers. It was extremely forgiving and could be mishandled in many ways but the rate of roll in the early versions was too slow for it to excel as a dogfighter. Charles Lindbergh was a key figure in improving the performance of the P-38. Working as a civilian contractor, he developed throttle settings and engine leaning techniques that significantly increase the range of the aircraft. With its distinctive design, the P-38 was sleek but its twin tails gave the Lightning a radical look — no one in that time had never encountered anything quite like it before. And you will see it here!